LOGLINE: Condemned houses are like abandoned lovers. SYNOPSIS: Condemned houses are like abandoned lovers that once shared good and bad moments. Now, because of abandonment and rejection they are left alone for selfdistruction. They are disappointed, upset and same proud. They’ll try to survive by resisting the passing of time. Yet if the lover comes back again one day, there is no possibility for living again together in the same house as it is. The house is now disconnected, worn by the weather and the aging of its stillness. The home has no more to offer as it once did. 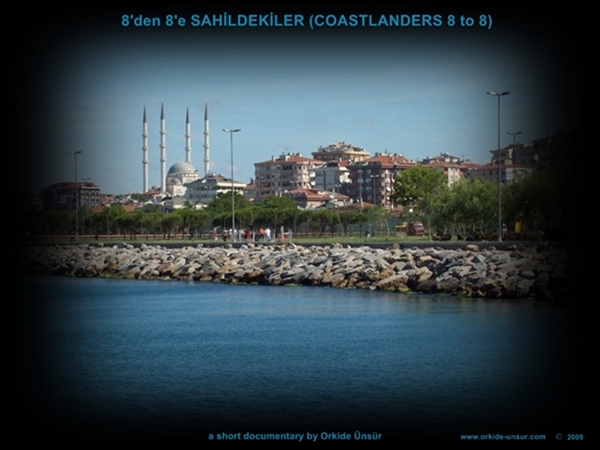 The editing procedure has finished and finally “8’den 8’e SAHİLDEKİLER” / “COASTLANDERS 8 to 8” is ready. I would like to thank to my friends Tamer Gültekin and Umut Can Sevindik for editing procedure. They did their best despite of their busy schedules. I am so happy with the music of my short docu and I am thankful to my extra ordinary talented friend Umur Türel for his wonderful, emotional song “Crying Out”. Before, I was thinking about the use some part of piano sonatas but I‘ve changed my mind. While we were talking about the music of the documentary he offered me to use his own music and he lighted a bulb in my mind. I listened and re listened all night long this song with slight tears in my eyes and called him immediately to say my decision! Another person whom I’d like to thank for his help and let me used for his old photography archieve about Maltepe Coastline is jurnalist & painter Mr. Aykut Ünker. MAKSEV and also Maltepe Association Board Member Mr. Zeki Hırçın is very helpful and kind too. In fact I have to thank the other Maltepe residents whom I interviewed and all the people around me who supported me especially my family and close friends. The pre-production and production procedures of “Coastlanders 8 to 8” (8’den 8’e Sahildekiler) have finished. And we are in post production procedure. This short documentary movie can be considered a part of and also a pre-production shooting of the main documentary project about Maltepe area in the future. We observed a summer day at Maltepe Coastline in Istanbul and interviewed couple of local people who know the old times of the area. Due to walking and working under the hot summer sun all day long we got sunburnt very much:-) Local people were helpful for us and especially old people were very pleased to hearing about short documentary. We did shooting on the boat and extra sunset shooting in other day. As I known before and also as I heard from the Maltepe people my short movie will be the first documentary about Maltepe Coastline. I like this place and I’m living here for many years. I also remember the old times we spent there with swimming etc. And I’ve been still spending some part of my daily time as walking and making fitness there towards to Princes’ Islands view. Logline: Brief oral history of Maltepe Coastline in Istanbul. Synopsis: A hot summer day at Maltepe coastline in Istanbul and the local community -including animals- who share the daily life there accompanied with the brief oral history of the coast and the Sureyya Beach at the background. I find the life under the sea is astonishing. The creatures which are living in a harmony with their nature rules in their habitat are so impressive for me. Although I am not a diver and not planning to become one in the future, this magical atmosphere effects me heavily and I respect it. water documentary about Kaş. So we planned our shootings and chose the most popular and interesting diving sites like Cave, Flying Fish, Canyon, and began to shoot. The most dangerous site was the Plane Wreck which only high professional divers like Okan are allowed. The plane had crashed for unknown reasons during the Second World War. The engine of the plane becomes visible at a depth of 57 meters; the other parts and the tail go down to the depths of more than 70 meters. Sometimes Okan followed a unique creature, or experienced the underwater exhibition with ceramic objects. And the night diving was done too. We decided to edit the movie with lyric style with the music but text. It would be reflection of the divine, holy and mystic atmosphere of the under water world of Kaş and the Mediterranean Sea. Turkish classical music consists of different kind of music tunes, a system of melody type called “makam”(maqam). Each makam specifies a unique intervallic structure and melodic development. Whether a fixed composition or a spontaneous composition all attempt to follow the melody type. Hidjaz Houmayoon makam belongs to Hidjaz family. Hidjaz (hijazz) makam is one of the oldest, most be loved and most common makam in Turkish classical music which gives the soul modesty, humbleness. Powwow time is the Native American people’s way of meeting together, to join in dancing, singing, visiting, renewing old friendships and make new ones. This is a time to renew thought of the old ways and to preserve a rich heritage. For me, Native American culture is always interesting with their philosophy, way of thinking, and shamanic rituals. In 1996 my brother Okan was in Montreal for education and I was working at ATV in Istanbul. We decided to shoot this short documentary about Powwow. I travelled to Canada and it was the longest trip in my life with 2 transfer destination. I had our Hi 8 camera in it’s case during all long hours by my side. When I was in Montreal I was very happy but totally jetlag and tired. During the shooting procedure, we are welcomed from the community and spent nice time with them. I remember, it was very hot time in the middle of summer in July but second day of the event it rained cats and dog which was surprising. I was nice experiment to know these people more, with observing their ceremonies, dances, songs, foods and talking with them personally.